ONI Bureau: India on Tuesday remembered the father of the Nation Mahatma Gandhi on his 70th death anniversary. 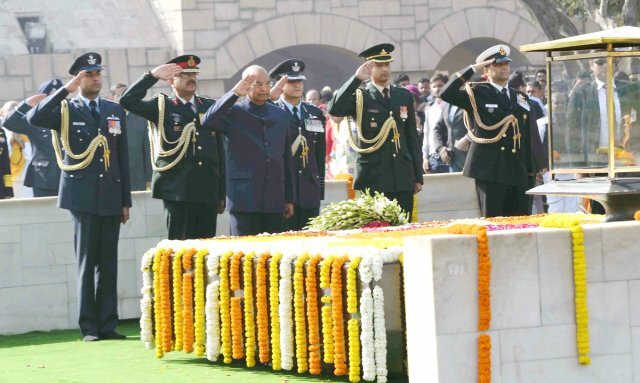 President Ram Nath Kovind, Vice President of India M Venkaiah Naidu, Prime Minister Narendra Modi, Congress President Rahul Gandhi and leaders from different political parties paid rich tribute to Mahatma Gandhi and attended Sarva Dharma Prarthana at Rajghat. Mohandas Karamchand Gandhi was the freedom fighter of the Indian independence movement against British rule & pioneer of non-violence. Gandhi was born on October 2, 1869, in Gujarat’s Porbandar district was assassinated on this day in the year 1948 by Nathuram Godse. Bijoy Mohapatra to rejoin BJD on Biju Birth Anniversary?